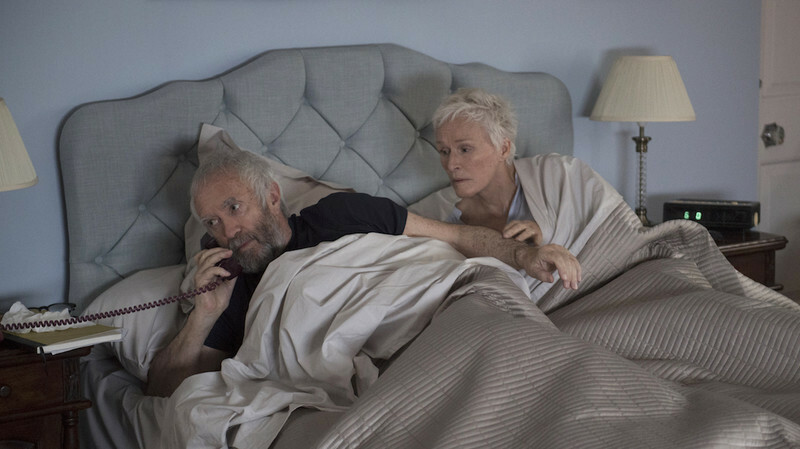 Glenn Close plays “The Wife,” and notably the title is not her name but her role—helpmate to an acclaimed literary figure. Their names, Joan and Joe Castleman, suggest there may be some unexplored blending between their characters. As the movie begins, he receives the news that he has been awarded the Nobel Prize and they fly to Stockholm for the ceremony. A lifetime of standing patiently in the corner as her husband gets all the attention begins to weigh on her, and when a journalist played by Christian Slater suspects that she may have had more to do with her husband’s success than either of them has acknowledged, she thinks back over all that has brought her to this moment. Close, Slater, and director Bjorn Runge met with three critics in Washington DC to talk about the film, based on the novel by Meg Wolitzer. Close began by talking about the mixed feelings of anger, regret, and guilt Joan is exploring through the course of the film. [Quotes edited for continuity and clarity]. I think it’s a progression there. 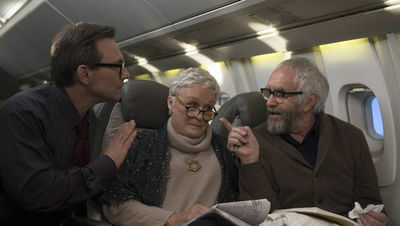 When you see her for the first time in the plane she knows her husband’s behavior and she's trying to make him not quite as rude to this guy [Slater’s character] who is so annoying. One of my favorite scenes was when we arrive in Stockholm and I'm just holding the coat in the background. I love that because that's what she did and she has to introduce herself. I've been around men who make women feel invisible and it's not a nice place to be in but it's something that Joan has accepted. I think in the film we see her growing awareness of how really far apart they are or have become as far as his belief, his almost belief, that he has done all this. She can deal with that. When she hears what they are saying about her work at the ceremony and then watching him—Jonathan Pryce is just brilliant in that scene—and watching him accept the award. That’s when it cracks … She’s been complicit. I think that’s what makes the story so complex. In the beginning it's because she loves him. She has a lot at stake and he accepts that at first. Then it eats him up and it eventually gets to her. She can’t deal with it anymore. We see the moment—and I love it because I think it's so real—where Joe, he realizes that he doesn't have talent and he's probably known that for a while and he says “I can't have a relationship with you because I'm not the talented one,” and she says, “No, no, no, I love you, I love you and I just, oh my God, I know how to fix it, do you want me to fix it?” That’s how they slip into it. He has to be worshipped by a woman, not superseded by a woman. She accepts the situation. It lets her write as she’s been told a woman cannot do, and she is happiest when she's at that desk writing. But she also has great guilt about the son as you know, maybe even more [painful] than her feeling of not being seen. The scene where the little boy is taken away, that's been the pattern. She didn't get up and say, “I’ll spend a half an hour with you.” She stayed. So I think what’s so interesting is that she's not without blame but there is enough fulfillment from her writing. I still think women give up a lot for men. The thing is, there has to be some sort of a balance. This is about a relationship that has become terribly unbalanced yet somebody has been fulfilled. She's fulfilled as an artist, she's not fulfilled as far as getting the acclaim that she deserves but I think funnily enough in that scene in the ceremony where things just crack inside of her, when she hears them describe her work and then sees him accepting that, I don't think it's about the acclaim. Is recognition different than acclaim? I think it's more about the recognition that she realizes what she's done and her husband hasn’t ever acknowledged that. Slater’s character has an extended scene with Close as he tries to get her to admit that she played a role in writing Joe’s books. He spoke about his view – and his character’s view – of their relationship. He sees the growth of Joe’s denial and delusion and then there’s also an interesting balance with her vulnerability. This is my personal outside observation but she doesn’t necessarily want the attention so she kind of makes her own personal choice to initially take the backseat and then it’s like, “Wow, wait a second, now we’re getting to a point where … ” That makes Joe a little bit more understandable and Joan a little bit more understandable. And he described his character’s own mixed feelings when asked whether he wanted the truth for truth’s sake or to make a name for himself as a journalist and how that relates to the story of the Castlemans. Like the other characters in the movie there are a lot of blurred lines. Everybody is kind of walking their own particular path but I think he wants a bit of both. He’s on this journalistic pursuit to get the truth. He thinks he's on to something. He’s found a kernel, some evidence, and he wants to pursue it to the end and also he wants to get his own prize at the end of the day. A lot of journalists and actors, too, we’re looking for that thing that will satisfy us and give us the attention and acclaim that somebody like Joseph Castleman is getting in this movie. That's the big prize. The Nobel is huge. And it creates the culmination of their relationship and creates that explosive moment. Runge pointed out the subtle differences between parallel scenes of the couple celebrating good news by jumping on the bed together in the flashbacks and the present. The first is “We got published, we got published!” and the second is “I got the Nobel! I got the Nobel!” From “we” to an “I”—that’s interesting. And he talked about the importance of staging the very formal Stockholm Nobel ceremony accurately. The Nobel Prize and the Stockholm city are very close to each other. The aerial shots were so beautiful because three hours before we shot that shot it was snowing and then we’re filming and the next day the snow was gone. It was the only day there was snow that winter. That was very important because people have an exotic view of Stockholm and it’s there in the beautiful overhead shots but for me the Nobel Prize world is deeply connected to the Royal Stockholm and I think we catch it pretty well. So the award ceremony when he received the award is one hundred percent what's happening in the real award ceremony. One change from the book was including the Castleman’s son David, played by Max Irons, on the trip to Stockholm. He is bitter, resentful and insecure because his father will not give him the support he needs. Runge explained what that character personifies. He’s the one that paid the price for the secret. I think if Joseph didn’t receive the Nobel Prize maybe the secret would continue much longer. If they didn't bring David with them maybe the secret could survive the Nobel Prize award ceremony also, so David is very essential there.